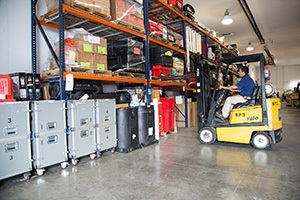 Storage – At Innovation Exhibits, our two warehouses are equipped to store a large number of exhibits of varying size safely and securely until you’re ready for them. We can assemble your custom exhibit, modify any existing assets or integrate the new exhibit with the old to create a dynamic solution that meets your needs. Shipping – We maintain good relationships with freight companies to get you the best price and to ensure that the exhibit arrives on time. All booths ship on schedule directly to the trade show’s warehouse or to the site itself, saving you the logistics headache of transporting it there yourself. 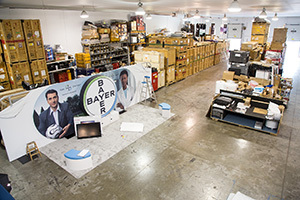 Installation and Dismantling – Our staff can travel with the exhibit to the show site and assemble it, or hire and supervise work crews when necessary for installing and dismantling the booth. We can even be present at the booth during the show to help with the flow of foot traffic.